Ora-Clens Dental Rinse An effective, safe and palatable, fresh antimicrobial formula for reducing plaque and freshening breath in dogs and cats. 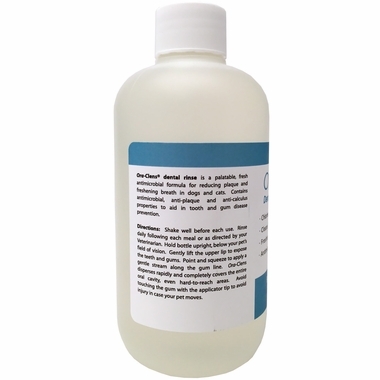 Contains antimicrobial, anti-plaque and anti-calculus properties to aid in tooth and gum disease prevention. Convenient at it's best! When you can't brush, flush with Ora-Clens! 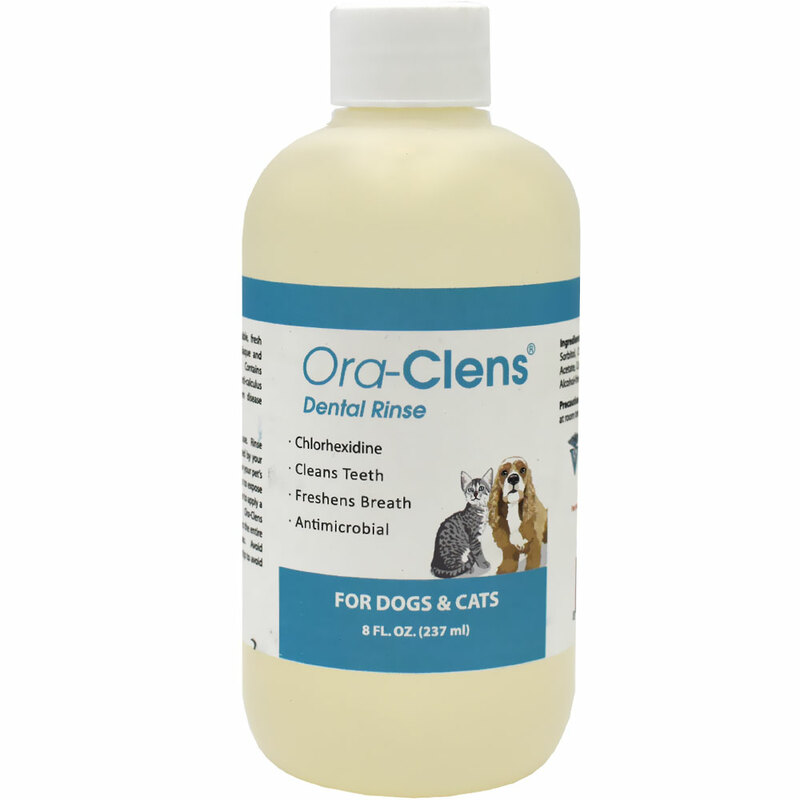 Brushing your pet's teeth is important but if you're short on time or your pet just won't allow it, Ora-Clens dental rinse is great for getting rid of the bad breath and helping to prevent dental disease. Ora-Clens Dental Wipes Active Ingredient .13% Chlorhexidine Gluconate - This active ingredient is an effective antiseptic, helps to reduce dental plaque and oral bacteria which causes bad breath. Cetylpyridinium Chloride - This active ingredient is an antiseptic that kills bacteria and other microorganisms. It has been shown to be effective in preventing dental plaque and reducing gingivitis. Ease of Use Shake well before each use. Rinse daily following each meal or as directed by your Veterinarian. Hold bottle upright, below your pet’s field of vision. Gently lift the upper lip to expose the teeth and gums. Point and squeeze to apply a gentle stream along the gum line. 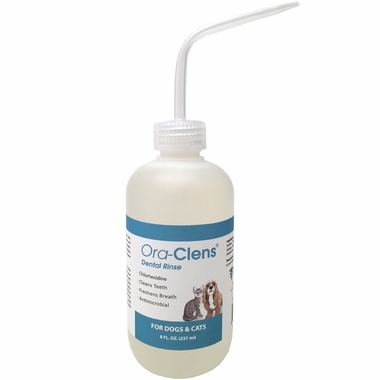 Ora-Clens dispenses rapidly and completely covers the entire oral cavity, even hard-to-reach areas. Avoid touching the gum with the applicator tip to avoid injury in case your pet moves. Shake well before each use. 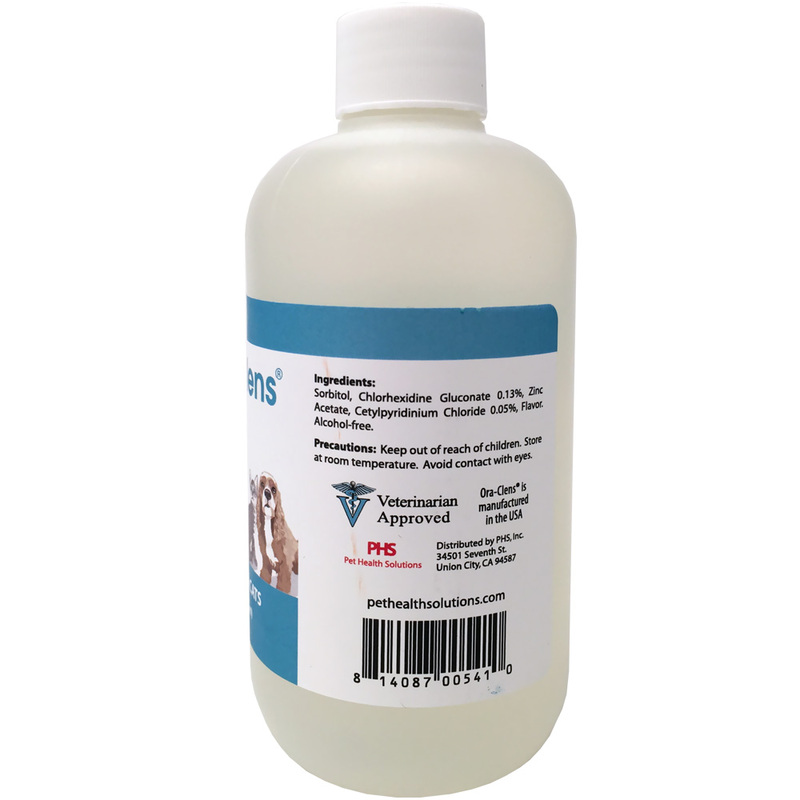 Rinse daily following each meal or as directed by your Veterinarian. Hold bottle upright, below your pet's field of vision. Gently lift the upper lip to expose the teeth and gums. Point and squeeze to apply a gentle stream along the gum line. Ora-Clens disperses rapidly and completely covers the entire oral cavity, even hard-to-reach areas. Avoid touching the gum with the applicator tip to avoid injury in case your pet moves. Precautions: Keep out of reach of children. Store at room temperature. Avoid contact with eyes.